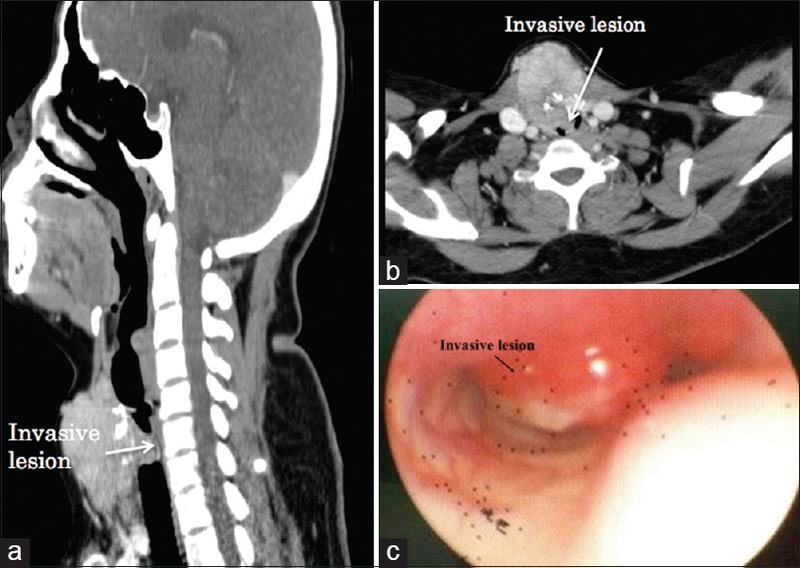 Airway management in patients with tracheal stenosis secondary to invasive tumors, especially when they present with signs of airway obstruction, is a challenging task. Though the primary airway management of choice is not well-defined, airway management in invasive thyroid malignancy can be dealt with a wide range of choices. Here we report such a case, managed successfully by awake guide-wire-assisted fiberoptic bronchoscope (FOB)-guided intubation. A 35-year-old female presented with history of progressively increasing swelling in the region of thyroid for the past 20 years. As it was associated with difficulty in breathing on exertion and lying supine for a past few days, she sought medical help. The swelling was hard in consistency with palpable lower border. Contrast-enhanced computed tomography neck examination revealed a 5 × 4 × 5 cm mass in the right thyroid lobe with tracheal invasion resulting in significant luminal compromise of trachea with tracheal shift toward the left side [Figure 1]a and [Figure 1]b. Preoperative FOB examination [Figure 1]c showed a fleshy mass, 4 cm below the level of glottis occupying more than 90% cross-sectional area of the trachea. Our preoperative plan was to perform awake FOB-guided nasotracheal intubation with the help of Cook's polytetrafluoroethylene guidewire. On the day of surgery, she was positioned in 75° semi-recumbent position. Oxygen was supplemented through nasal prongs. Intravenous dexmedetomidine was infused to maintain optimal level of sedation. Awake nasal fiberoptic was performed with spray-as-you-go (SAYGO) technique. Beyond 4 cm from the glottis, tracheal invasion by the tumor mass was noted. Cook's guidewire was passed beyond the tracheal mass. This was followed by the railroading of FOB over it. Once the tracheal carina was identified, the preloaded endotracheal tube (ETT) was railroaded across the tracheal narrowing. The position of ETT was confirmed by FOB. Subsequently, general anesthesia was induced. After completion of total thyroidectomy, sleeve resection of trachea and primary anastomosis was done. She was extubated at the end of surgery and postoperative course was uneventful. Airway obstruction by a thyroid tumor may result from extrinsic compression or intrinsic obstruction by tracheal invasion. By context- sensitive airway management principle, airway intervention in such cases depends on the degree of tracheal narrowing, available airway equipments, and anesthesiologist's expertise. We had chosen awake FOB-guided intubation as a primary choice as we anticipated difficulty in ventilation, intubation, and front of neck surgical airway intervention. Preservation of spontaneous ventilation is the safest option in any compromised airway situation. Cook's guidewire was used to negotiate into the narrow space between the mass and the tracheal wall. Railroading the ETT preloaded FOB over the Cook's guidewire prevented unintentional injury to the tumor mass thus ensuring atraumatic passage of the ETT. If the guidewire was not in place beyond the mass, simple FOB-guided intubation would increase the chances of airway edema while passing the FOB/ETT and injury to the tumor mass causing torrential bleeding into the trachea. Placement of Cook's guidewire had in fact facilitated the spontaneous ventilation effectively (as FOB would have totally occupied the narrow space through which the patient was breathing). Also, the presence of the guidewire beyond the tumor mass can help the anesthesiologist quickly railroad the ETT over it and secure the airway in the event of accidental bleeding from the mass during airway management. Rigid bronchoscope was kept ready as a rescue plan if there were events of airway collapse and bleeding from the tumor mass. Preserving spontaneous ventilation is the key to airway management in cases where tracheal lumen is narrowed by infiltrating tumor mass. Cook's guidewire can act as a useful and alternative airway adjuvant in facilitating spontaneous ventilation in such scenarios. Cook TM, Morgan PJ, Hersch PE. Equal and opposite opinion. Airway obstruction caused by a retrosternal thyroid mass: Management & prospective international expert opinion. Anesthesia 2011;66:828-36. Hung O, Murphy M. Context sensitive airway management. Anesth Analg 2010;110:982-3. Wendi C, Zongming J, Zhonghua C. Airway management in a patient with upper tracheal tumor. J Clin Anesth 2016;32:134-6.